Robin Hood fans – and others – will love to play archery, which is a sport that requires determination, patience and skill. Archery is also, surprisingly, a very social sport, and one that can be enjoyed by people of all ages and varying skill levels. In fact, perhaps the best thing about archery is that it can be very family-orientated, with children playing next to grandparents. Anyone can play, and there are outlets available for any skill level, and different types or formats of the sport. Target archery, for example, is the only type of archery allowed to be played in the Olympics, with paraplegic competitors often played alongside able-bodied ones. Archery is an ancient sport. In Britain, the first historically recorded archery event took place in Scotland as far back as 1483, with certain types of longbows dating back even earlier. Men were often required to become skilled archers in order to protect royalty, and rumour has it that football was banned at times to allow the males in the kingdom to spend time perfecting their archery skills instead of wasting time kicking a ball around. Archery first became an Olympic event in 1900 in Paris, and has been a permanent part of the Olympics since 1972. Archery has been a sport at the Paralympics since 1960. Target archery. As mentioned above, is the only type of archery featured at the Olympics. A specific number of arrows is used to shoot at round straw targets, called “Bosses”, and points are accrued for aim. Field archery. Competitors shoot not at Bosses but at foam plastic faces and animals that are in the countryside or woods. Clout archery. Competitors shoot at a target flag a distance away in hopes of becoming the closest to hit the flag. Not as popular as a large space is required to carry out this sport safely. Children’s archery venues are scattered across the country, and offer either lessons or a one-off introduction to archery, for children to become better acquainted with the sport. Look online or ask around to find one near you. 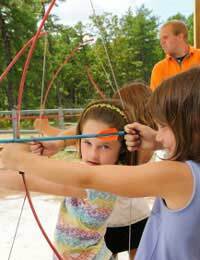 Some archery clubs offer children’s archery parties, which can be held indoors or outdoors, depending on the venue. Mobile ones can come to you, if the location is suitable, or suggest a venue near you. This can be a fantastic introduction to archery for your children. If your child likes the introduction, professional archery tuition might be the next step. Lessons for beginners often offer Have a Go sessions, if you want to make sure this is the right sport to invest in first. Ensuring that your children never point a loaded arrow at another person, up in the air, or at a great distance – in case it lands where it shouldn’t! Checking that nets or the equivalent are used to catch stray arrows. Practicing proper archery etiquette at all times, meaning not walking where you shouldn’t, stepping in front of the shooting line, or shooting when someone could get in the way. Making sure all the equipment is in good nick, and thus safe to use. Archery is a fun sport the whole family can enjoy, and is suitable for fairly young children on up. Treat your kids this summer to an archery Have a Go session – you might be opening up a whole new world of fun!